Let me begin by moaning, in a very British way, about how hot it is in London today. Thirty-six degrees and I am sweating like a pig on market day. (I know, I know, these sentiments only add to the writer’s mystique…). I have soldiered on and I am presently sitting in a shaded area with a gigantic iced coffee and a laptop. Even I, with my undeniable caffeine addiction, couldn’t stomach a hot coffee today. Back to the point of this blog posting! Yesterday, I was invited along to one of Amazon’s major distribution centres in glamorous Milton Keynes to take a look at the goings-on there. 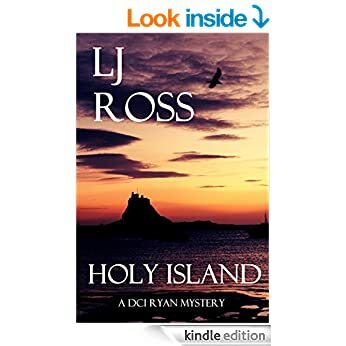 Not only did this offer a tantalising glimpse behind the corporate veil, but it allowed me to take a tour around their Made on Demand printing operation which is what I’ve decided to use to bring out ‘Holy Island’ in paperback. It’s a fantastic option if, like me, you mostly sell e-books but would like to offer people the option of a paperback without sacrificing all your creative rights to an outside publisher. It’s a whole new way of looking at the world of publishing and I’m loving it so far! So, I took a teeny tiny train to Ridgmont, the closest train station to the distribution centre, and I have to say that I felt a bit like Harry Potter on his way to Hogwarts. It’s not quite that exciting, but it was definitely an interesting day out. Firstly, I was seriously impressed by their print works. Those guys love their jobs, judging by the attention to detail that I saw while I was there. Every single book printed goes through several layers of quality control before it is sent out to a customer. As an author, it’s very reassuring to know that, so long as I take care of quality in my storytelling, they will take care of quality in distribution. Quite apart from that, it is always encouraging to see people who appear genuinely enthused by their work and many of the employees there have been around for years. In a wider sense, my overall impression was of a company run like a well-oiled machine. The (huge) warehouse was humming with smooth activity, the walkways were free of debris, the staff looked cheerful rather than done in. I was slightly disappointed not to have seen somebody freestyling with one of the trolleys (this would have been me, if I worked there) or swinging between the crates in true Indiana Jones style (if I didn’t have vertigo, this would also have been me).